As naturally athletic animals, the horse’s lungs have evolved for maximum efficiency in flight from predators. The pressures of the modern equine life, such as stable bedding, dried forage and enclosed areas, can be acutely detrimental to these large, delicate organs. Research shows that by supplementing the diet with naturally sourced antioxidants, the horse’s lungs can be given valuable support. RESPIRATOR contains a high concentration of procyanadins and flavonoids with ortho phenolic groups which are particularly potent antioxidants. These have been chosen for their targeted support of healthy lung function. The unique blend of nutrients provided by RESPIRATOR supports the mucosal immune system within the respiratory tract and the delicate lung tissue itself. RESPIRATOR is recommended for all horses showing signs of compromised lung function caused by mould spores, air borne allergens, pollen and dust. 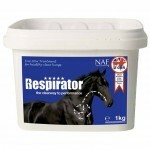 RESPIRATOR is also recommended where close contact with other horses showing respiratory stress may be cause for concern. Feed RESPIRATOR when compromised lung function or dust challenge is seen, to support clear, healthy lungs.